So this morning was the ever important first ultrasound. We went in assuming I’m around 6 weeks 6 days, so a heartbeat should be visible, and maybe audible, but not necessarily. Y’all, I’ve been nervous. I was nervous last night that I would be so wretchedly disappointed if there’s not two in there (I’ve been hoping for twins!). I was nervous that there would be NOTHING in there. Or that the something in there wouldn’t have a heartbeat. And I have been completely disturbed by my feelings of… ambivalence. I’ve wanted this for SO LONG, and now that I have it… why haven’t I felt more excited or connected to it?! And why did I used to love helping take care of my neighbor’s kids, and now, I feel no motherly anything towards them whatsoever. Isn’t pregnancy supposed to make you all maternal feeling, not anti-maternal feeling?! So many thoughts and feelings bouncing around my head at once. All of that- every doubt, every nerve, every feeling washed away this morning. My husband and I were sitting in the ultrasound room, the doctor came in and asked how far along we should be, and the ultrasound commenced. And there it was. One perfect little almost human looking baby. And I didn’t even care that there was only one. My husband immediately saw the heartbeat flickering. I did not. He and the doctor had to point it out to me. But then… THEN… the doctor turned on the sound. And I heard the heartbeat. I heard it like it was my own. But it wasn’t my own. It was the baby’s. And tears came into my eyeballs. I wasn’t disappointed in just having one. 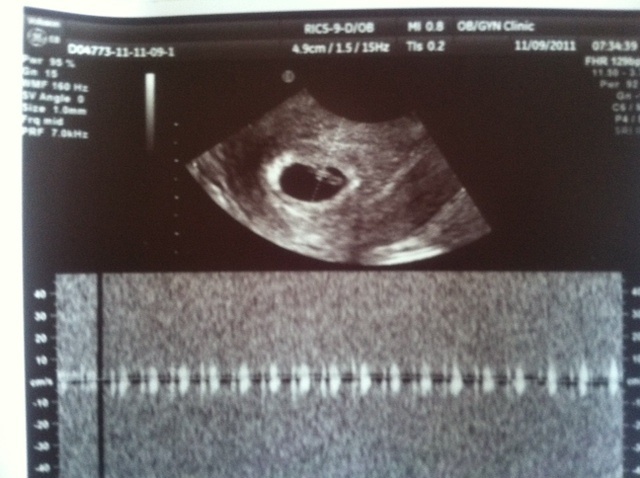 I finally believe that there is a little life growing inside me. I realized why I haven’t been so maternal-ish to my neighbor’s kids too… because suddenly I have this overwhelming feeling that my kid is better than anyone else’s kid (now I get where parent’s get that idea from… but I promise not to parent like it), and I just want mine. 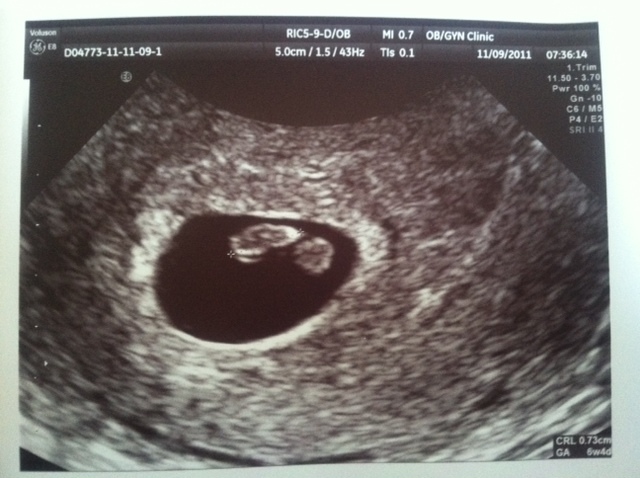 The baby measured at 6 weeks 4 days, which is only 2 days off of our estimate, which is awesome. It also makes sense because that puts conception on Saturday- the IUI was done midday on a Thursday, and you know… we did stuff through the whole weekend. : ) The heartbeat was good and strong for this early on at 129 bpm. I was surprised at how clear he/she is. I thought babies were supposed to be hard to see this early on... but apparently not anymore. You maybe don't so much care about this... but I totally do. It's the heartbeat. The glorious sound waves of the heartbeat. ** Baby Bunny because my husband and I have this extraordinarily odd habit of calling each other random animals as pet names. It’s been hippo, moose, etc. etc. and bunny. Bunny has been the most recent, and generally a pretty long standing, pet name. And now we are growing a baby bunny. Yea, yea… go ahead and roll your eyes. I stay with the RE until the end of the first trimester, according to him, unless he changes his mind. We go back for another ultrasound next Wednesday, and generally every 1-2 weeks until the end of the first trimester. He is keeping me on Metformin until he tells me otherwise. And prescribing me vitamin b6 to help out with the attacks of nausea that come every night. And I’m to go buy this specific type of disgusting ginger drink. I just might tell them this when they graduate me up. I just might. As for this blog… now that we’ve seen the baby and know that, at least for now, it’s alive and well in there, I will be moving all posts baby related over to my main blog, The Army Doctor’s Wife (linked now, so you don’t have to search it out : ) ). If you’re interested in following along and continuing to read about how this pregnancy goes, please subscribe to that blog and/or add it to your reader. Thank you so much for all the support you’ve offered me over here. You ladies made me feel so much less alone in the world of infertility, and gave me hope on a daily basis. I intend on continuing to read about you guys’ journeys on a regular basis, and offering love and encouragement where I can. I will NOT be shutting down this blog entirely… because I will always have the PCOS, and want to be able to come back and vent about it as needed here. Thank you all for your continued love, encouragement, and support. It has meant more than I have words to put in a blog. This entry was posted in encouragement, hope, pregnancy by L. Bookmark the permalink. Congrats on the baby bunny!!! So glad that everything is going well and I wish you a very happy and healthy 9 months!